The State Wars 11 United States Roller Hockey Championships took place from July 29-Aug. 9 at the St. Peters Rec Plex in St. Peters, Mo. California teams brought home a sizable load of hardware from the event that matches players by birth year and featured 316 teams and more than 950 games this year. Team Southern California collected seven medals, including three gold (6U, 2006 AAA, 2004 AAA), three silver (2006 AA, 2003 AAA, 2000 AA,) and one bronze (2007). 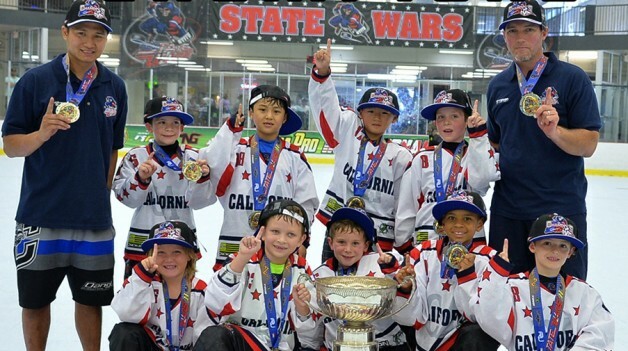 Team Northern California captured two gold medals (2001 AAA and 1997 A). Besides the age-group teams, California Labeda USA won the gold medal in the Masters 35-and-Older division, while the California Pama Cyclones captured the bronze in the Senior AA bracket and the Pama Cyclones took home the bronze in the Pama Pro Invitational. Division Most Valuable Players included Team SoCal’s Liam Hargrove (6U), Brendan Vincent (2006 AAA/AA) and Anthony Yu (2004 AAA/AA) and Team NorCal’s Jaden Guzman (2001 AAA/AA) and Trevor Haertl (1997 A). High scorer award-winners included SoCal’s Aiden Yu (6U) and Anthony Yu (2003 AAA/AA). Most Valuable Goaltender award-winners included SoCal’s Connor Ellis (6U), Luke Nadolski (2006 AAA/AA) and Kiera Tallas (2005 AAA/AA) and NorCal’s Maxwell Rogers (1997 A). Best Defensive Player award-winners included SoCal’s Brandon Grant (2004 AAA/AA), Ruben Lopez (2003 AAA/AA) and Cooper Haar (1999 AAA/AA), along with NorCal’s Dylan Naro (1997 A). Joe Cook (Masters) earned MVP honors for California Lebada USA, while Nevin Iwatsuru (Senior AA) earned MVG honors for the California Pama Cyclones. SoCal’s Aiden Chan (2006 AAA/AA) and NorCal’s William Robinson (1997 A) took home top sniper honors in the skills competition. Fastest skater winners included SoCal’s Tyler Webb (2006 AAA/AA) and Aaron Moncada (2002 AAA/AA) and NorCal’s Guzman and Kellen Ireland (1998 A). Top goaltender winners included SoCal’s Ellis, Tallas, Tyler Kitchen (2000 AAA/AA) and Matthew Dunton (1998 A). For complete team standings and statistical leaders, visit StateWarsHockey.com.